"A farcical and fabulous tale of two classic female friendships!" HARLEY & IVY MEET BETTY & VERONICA collects a six-issue set following the antics of two classic friendships -- whacky anti-hero Harley Quinn and supervillain Poison Ivy, and everyone's favorite girl-next-door Betty Cooper and rich girl Veronica Lodge. This story will be more enjoyable to readers who are familiar with these characters. This story takes classic characters and gives them the "Freaky Friday" treatment with delicious results. Due to some magical shenanigans, Betty and Harley, and Veronica and Poison Ivy swap bodies. While super inconvenient and discombobulating for Betty and Veronica, this turn of events actually works out to benefit Harley and Poison Ivy. Paul Dini and Marc Andreyko tell a delightfully loopy tale with artwork by Lara Braga that captures the zany storytelling beautifully. Veronica's business tycoon dad is a natural as a Poison Ivy foe. I like how, eventually, seeing her dad in a different light gives Veronica a fresh perspective. In body-swapping stories like these -- perspective is everything and usually generates the most humorous and poignant moments. Betty and Veronica soon realize that the life of supervillains and anti-heroes is not what it's cracked up to be. Riverdale and high school look better each day they're stuck in their costumed fantasy gone horribly wrong. The environmental and criminal storylines intersect in a way that is a bit of a stretch, but the journey the characters take getting to that point, and the over-the-top resolution to the story, makes this book worth reading. HARLEY & IVY MEET BETTY & VERONICA is a farcical and fabulous tale of two classic comic book friendships. This story profiles and highlights the very different dynamics in both female friendships. A scene near the end between Jughead and Harley have me hoping those two characters cross paths again. Sabrina and Zatanna are another amazing mix that would be great to duplicate in a future story. 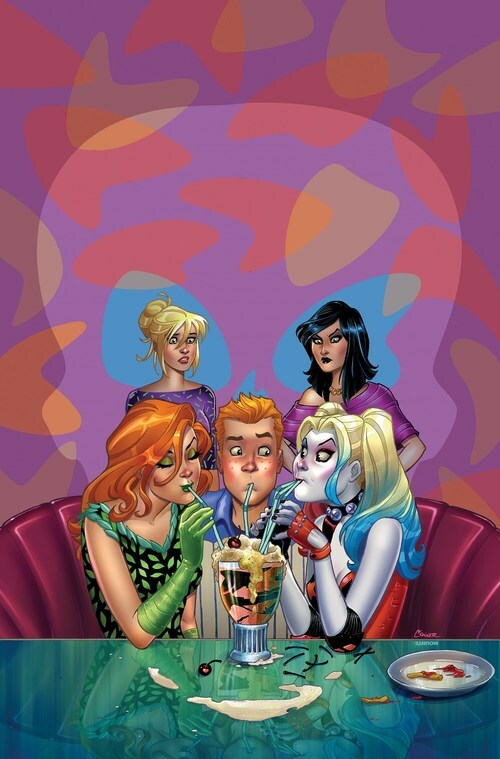 Gotham City meets Riverdale in this crossover graphic novel that brings together four of the most iconic characters in comics--Harley & Ivy and Betty & Veronica! From Paul Dini, Emmy and Eisner award-winning creator of Harley Quinn and BATMAN: THE ANIMATED SERIES, and Marc Andreyko, acclaimed writer of WONDER WOMAN '77. Riverdale's resident billionaire, Hiram Lodge, has a plan to offer free college tuition. The town just needs to build a new campus by draining the wetlands that lie between Riverdale and Gotham City. Everyone is thrilled...except visiting ecologist Dalia Green, a certain botany-obsessed super-villain in disguise! Poison Ivy realizes she must resort to drastic measures to thwart Hiram Lodge's plan to destroy the wetlands and the many species of endangered plants that live there. Scheming with her daffy bestie Harley Quinn, the villainous pair plan to kidnap Lodge's daughter, Veronica, and her friend Betty. Once Lodge abandons his building plans, Betty and Veronica will be returned safely--but not before mayhem ensues. Are these two teams of BFFs headed for disaster? Collects HARLEY & IVY MEET BETTY AND VERONICA #1-6.